While the Community Newspaper Group's interviews with the Democratic Mayoral candidates, Comptroller Bill Thompson and Queens City Council Member Tony Avella, have already been summarized in the CNG's reports, the video is worth watching for an extended look at their analyses of Atlantic Yards. Notably, Thompson showed himself to be a supporter of affordable housing and Community Benefits Agreements, though he offered no definition for the former and vague reform proposals for the former, while Avella addressed both issues with more criticism and more detail. Unlike many candidates, who rely on funds from the real estate industry, Avella said his game plan was to tell the industry they no longer control the city's land use agenda. Look for Atlantic Yards to come up again during an hour-long debate between the two on Wednesday, September 9, to be broadcast live on WABC television (Channel 7) and 1010 WINS from 7 to 8 pm. At 8:25 of the Thompson interview, the Courier-Life's Stephen Witt, a fan of the Atlantic Yards project, framed the question this way: "As a lifelong Brooklynite, that do you think an NBA team would do for Brooklyn?" "I don't think it would hurt Brooklyn at all," responded Thompson. "But that wasn't the attraction of Atlantic Yards. It just wasn't a basketball stadium. If it was a basketball stadium by itself, I don't think it makes sense. The attraction of Atlantic Yards, at least for me, was the affordable units, which were substantial, as well as the Community Benefits Agreement, which would provided business and jobs and other things for local residents. I thought that was the valuable part of Atlantic Yards. I supported Atlantic Yards, but I didn't do it early, I did it late, because I thought those were the valuable parts." Witt followed up: "What do you think of the project so far, and Mayor Bloomberg actually came out against Community Benefits Agreements when he was here. What's your view on Community Benefits Agreements and where do you think Atlantic Yards is right now and what should happen?" "I don't know exactly where Atlantic Yards is," Thompson responded. "It's a project that I've been concerned about for the last couple of years. It continues to shift and change. As I said, the part of the Atlantic Yards project that was of huge benefit was the affordable housing piece. I want to see that-that's the piece that needs to move forward, as well as the community benefits piece. So I don't exactly know where Atlantic Yards is--it continues to shift, to change, and that is a constant concern on my part." While "affordable housing" is hard to criticize in the abstract, a limited amount of subsidies should be deployed in a cost-effective manner and Thompson, the Comptroller, didn't seem to consider that. "Community Benefits Agreement--the one thing that I would say say, I'm not against a Community Benefits Agreement at all," Thompson said. "I've supported them in a number of places... If you look at the Kingsbridge Armory [in the Bronx]... I support those discussions. However, we should have a blueprint--it almost should be part of the approval process." Here Thompson touched on the criticism that there are more and less legitimate versions of CBAs; notably, experts on CBAs have criticized the Atlantic Yards CBA for involving hand-picked groups and not being enforceable. :You send each project out and say--in some cases, the mayor saying, don't talk to the community--I think that's a mistake, or don't engage in a Community Benefits Agreement, there should be a blueprint, that during the approval process, that's what's agreed to. I don't see anything wrong--I'll use Kingsbridge as an example--of talking about the type of jobs, the type of things that go into a project," Thompson continued. "The phrases I like to use are smart growth, and fair growth. I think that communities need to be involved in the development, in the process, to talk about what goes into their communities," he said, failing to acknowledge the criticism that Atlantic Yards bypassed the city's Uniform Land Use Review Procedure (ULURP). "So I don't have a problem with a Community Benefits Agreement, I just think it would make more sense if you didn't say to each council person, elected official, community organization, and others, go negotiate on your own. I think there should be a template that the city uses, with each project, that goes into each development." Neither Thompson nor Avella brought up the recent revision of the Metropolitan Transportation Authority's deal with Forest City Ratner for the Vanderbilt Yard. At 13:05, Brooklyn Paper publisher emeritus Ed Weintrob, who has supported stimulus funds for the Atlantic Yards arena, followed up: "If Bruce Ratner comes to you as mayor and asks for more money on some form, whether it's tax abatement or government bonds, would you support additional money for Atlantic Yards?" 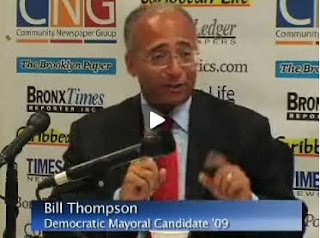 Thompson responded with a hedge: "I think Atlantic Yards has been well supported by the public right now. I'd been asked a few months ago, would I support stimulus money going into Atlantic Yards, and I flatly said no. I think that right now that project has received a lot of public support." Weintrob followed up: "Even if it came down to the point to the point where Bruce Ratner said, without additional funds, the project doesn't go forward, the affordable housing doesn't go forward., would you be willing to listen to him?" "Then I think you'd have to start to look to see what else is part of that project, as opposed to just affordable housing," Thompson said, apparently citing the arena and an office tower. "It was never just affordable housing. there were a number of other components... What would we be talking about? If it's for the affordable housing piece, just for that, maybe you'd consider it. If it was for other parts of it, I don't think so." But why would Atlantic Yards affordable housing deserve stimulus funds rather than affordable housing elsewhere or, instead, investment in transit that would benefit more people and also create housing? At about 5:45 of the Avella interview, Witt again got to frame the Atlantic Yards question: "You've long championed affordable housing and the Atlantic Yards project includes over 2000 units of affordable housing, yet you oppose the proposed project. What do you think should be done--?" Avella jumped in: "Well, first of all, are the 2000 units really affordable? I mean, are they affordable to people who need it? This is the big issue in affordable housing today. When Mike Bloomberg talks about 100,000 units of affordable housing, it's not affordable to the people who need it... Is there really a plan here?" "I don't believe in overdevelopment, I've fought overdevelopment my entire career," Avella continued. "There is a balance that we can achieve, where we can support development with community involvement, to make sure that development is an asset to a community, not a detriment, and that it has a real affordable housing component." "We base affordable housing in this city, generally, on the metropolitan area median income [AMI], which not only includes income from New Yorkers also from the wealthier neighborhoods of Nassau and Westchester, so it brings up that income level. The general rule of thumb is 80 percent of that AMI figure, which is about 66, 67,000 dollars. That's not affordable to the people who need it. The example I always use is the Greenpoint Williamsburg rezoning, where we did 80 percent of AMI. The average median income for those neighborhoods is like 25, 35,000 dollars. So all we're doing is pushing out people from their own neighborhood, gentrification. I want to see the affordable housing component changed, so it's based upon neighborhood AMI. So then when we build the project, like the Ratner project, if we get community involvement and work out all the kinks, it'll be affordable to people in that community." Actually, the AMI is now $76,812, and the Atlantic Yards project would include subsidized housing for households from 30% to 160% of AMI, with 900 of 2250 promised units over AMI. Brooklyn Paper Gersh Kuntzman asked, "How would that be achievable?" Avella responded, "It's partly by we change city law, and I've actually been working on that legislation now, and we also might have to provide some subsidies." That's an understatement--the more affordable the housing, the more subsidies--though the cost of construction and other subsidies may vary. Avella went on to allude to the state's override of local zoning for Atlantic Yards: "But if we're giving a developer the ability to build greater than the existing zoning, and zoning exists for a reason, then there should be a mandatory--we have to change the whole philosophy on how we do development in this city, to get affordable housing--there has to be a mandatory component, if we're going to allow you to build x, y, and z of affordable housing. The other aspect is city's going to have to get into the business of doing it. We're going to have to allocate capital dollars and actually build affordable housing. That's how it was done years ago." The city's willingness to rely on tax incentives and optional zoning bonuses has been criticized by those who believe in mandatory inclusionary zoning. Witt followed up: "The Vanderbilt Yard, it's been a hole in the ground for 75 years. What do you think should be done at the site, what's a concrete plan?" Note that Witt adopted the language of project boosters like Borough President Marty Markowitz in calling a working railyard a longtime "hole in the ground." Avella responded, "Reduce the density. I think it's too much for that area. I think it would overburden the infrastructure, overburden the traffic situation--reduce the density, and have a real conversation with the community. And this goes to my proposal to change the entire planning process in the city, instead of from the top down, from the bottom up." "Other cities across the country have implemented plans like this," Avella continued. "I've been working with the Municipal Art Society for two years now to come up with the legislation to do this. Give power to people in their own neighborhoods to plan for their community. Give them an urban planner." This is something Manhattan Borough President Scott Stringer has championed, but Markowitz has not. "Give them the technical expertise and let them start to do planning, where we need affordable housing, where we need economic development, where we may need a new school or infrastructure improvements," Avella continued. Kuntzman followed up: "Suppose we needed an arena. I don't ever see a community group coming forward and saying we need an arena." Indeed, it's not easy to site facilities of borough- and city-wide importance but where the local impact would be greater, and Avella only got part of the way. He responded, "That's one of the criticisms of the plan, well, wouldn't you get the NIMBY approach... first of all, there has to be some general parameters. There has to be a sanitation garage, for example. There has to be an asphalt plant someplace. We'll give the community general guidelines to follow. And the experience has been, in other places where they've institute this type of plan, Seattle, Washington being the foremost... You don't get the NIMBY approach, because when you give people real power, they'll generally do the right thing. What we have in New York City is: why should I take x number of facility, when I know the neighborhood next to me is gonna fight not to take it?" "We have to change the planning process," Avella concluded. "Because we don't do planning in this city. We do knee-jerk reactions to individual developers, and that has to stop." Indeed, Atlantic Yards is a response to an individual developer. Witt followed up: "With that said, how would you foster bringing developers in? There's the LDC approach, which seems to mean what you're indicating, but if a major developer comes in, do you believe you have to foster that and want that?" I don't think that Avella supports LDCs--local development corporations--but may instead support CDCs--community development corporations. 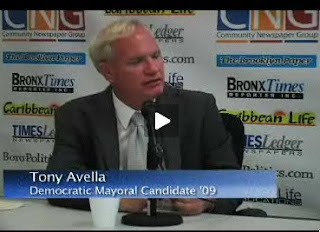 Avella responded, "The city thrives on development. I've yet to meet anybody who's totally against development. But they want it to be an asset to their community, and something that destroys the very character and charm of that particular neighborhood. And that's what we're doing each and every day, and that's got to stop." Avella has made neighborhood preservation a cause and the Bloomberg administration is certainly open to criticism, but, while upzoning many neighborhoods, it's downzoned others, as well. "New York City's made up of neighborhoods," Avella continued. "That's the reason people live in particular neighborhoods. That's why we have the tourist industry. There has to be a cooperative relationship. You set that agenda and that priority from the top and you have to be the mayor to do it... I think we can have a balance, but we don't have it now." "The pendulum has swung too far in favor of the developers," he continued. "It's got to swing a little bit back. Somewhere in the middle, with community-based planning and a real working relationship with developers, I think the city would be a better place. And I think it would also be easier for developers to develop their particular project or their particular development. Because right now... I particularly think the Department of Buildings is a disgrace, and I've heard from developers and the community. Why not set up a system in which things get done, they get done in a faster process, and they get done better." A little later, Avella was asked if he'd support an enforceable CBA at the Kingsbridge Armory. Avella responded, "It's interesting that you get into Community Benefits Agreements, because they're outside the normal Uniform Land Use Review Procedure. I'm chairman of the Zoming Committee. When it comes before me, if there's a zoning change, we can't even consider it.... Somehow this has to be addressed." He continued with a criticism that sounded not unlike that of Bloomberg, who called CBAs extortion: "I think it's legitimate to bring in some of the issues that normally fall under the category of a Community Benefits Agreement, labor issues, benefits for the community, in return for allowing a developer greater density. But how you do that is the question. And I'm not a fan of having private individuals negotiate these things outside of the public view. That leads to corruption and it leads to a lack of oversight as to how you do enforcement down the road. Some of the agreement have incorporated the Community Board, and the Community Board can be the entity by which the city sues. But I think we've got to come up with a process by which these Community Benefits Agreements can be included in the overall zoning change, ULRUP process. So we all know what's going on, it's above-board, in the public view, and there can be some oversight in the future." Would developers agree to CBAs as part of ULURP? "i think they would, because now they have to do it anyway, to get some of the approval of some of the elected officials," Avella responded. "I think they'd rather have it out in the public, rather than these backroom deals being made. And then there's criticism from all sides.... As long as it's--and this is the key--it's Community Benefit Agreements that are tied to the impact a development can have. Because there's a fine line between addressing impacts a development might cause, as to shaking down a developer. And that's going over the line when you start shaking down a developer. " Later in the interview, Avella was asked if there was any model for development in New York that he could point to. No, he acknowledged, offering his campaign slogan: "The revolution starts now." Later in the interview, he talked about housing issues, including keep rents affordable, providing new affordable housing, and saving Mitchell-Lama buildings. "We have to sit down with stakeholders, and come up with a process," he said, acknowledging, "I don't think anybody has the real solution. Where I hear some of my colleagues... nobody really has the solution, let's admit it... this is a very complicated issue." Witt acknowledged there might not a solution, but suggested "you come in with a game plan." "Well, the game plan is, first of all, tell the real estate industry: your days of controlling the agenda are over," stated Avella.